Countdown To 2011 New York Auto Show: 2012 Subaru Impreza Debut? The Subaru Impreza concept shown at the Los Angeles Auto Show last November could debut in its final form at the New York Auto Show next month ahead of its August on sale date. Impreza was third in sales (44,395) in the 5-model Subaru line-up last year behind Outback (93,148) and Forester (85,080). Despite the pending new 2012 Impreza, February sales were up 40.3 percent to 3,933 from February 2010. Subaru sales continue to rise to record levels, gaining 21.8 percent in 2010 over 2009. Porsche Panamera Turbo S with its 550 horsepower 4.8 liter twin-turbocharged V8 engine will debut on April 20 at the New York International Auto Show. 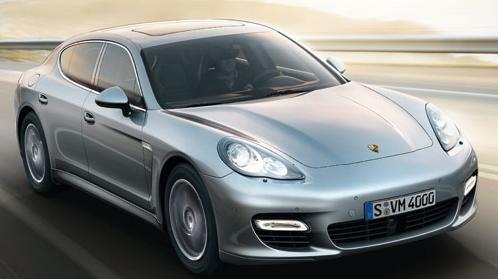 The newest Panamera can reach 60 mph in just 3.6 seconds and the top track speed is 190 mph. The 50 horsepower increase delivered in the Panamera Turbo S over the Turbo can be attributed to two main enhancements: new twin turbochargers with titanium–aluminum turbines and a modified engine control. Titanium–aluminum reduces the turbine and compressor wheel's weight, which results in a quicker turbo response that improves the engine's agility. The torque is also increased over the Turbo from 516 lb-ft to 553 lb-ft. In the "Sport" and "Sport Plus" mode of the standard Sport Chrono Package Turbo, the overboost function can temporarily generate additional torque with a peak rating of 590 lb.-ft. The new Porsche Panamera Turbo S will go on sale in the U.S. later this spring, and will have a base MSRP of $173,200, excluding $975 for delivery and destination. 23 car manufacturers have scheduled press conferences during the two media days so we're expecting to see many 2012 models and concepts, which today become reality in the not so distant future. Stay tuned for more previews. Kia started their LPGA golf tournament sponsorship a year ago at LaCosta Resort & Spa in San Diego's north county and the 2nd annual Kia Classic which just finished today drew a huge gallery despite the 4 inches of rain during the 4-day tournament. 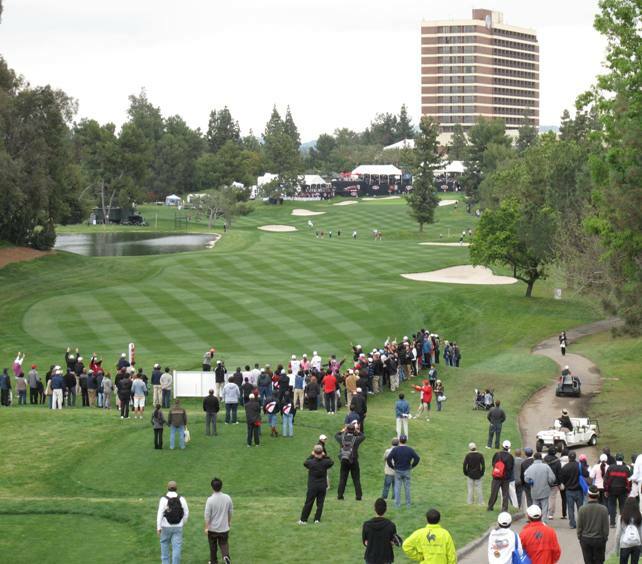 Located 30 miles east of downtown Los Angeles, Industry Hills is close to many Asian communities which came out to support the Korean-dominated women's tour. The line-up of players, proximity to Asian communities and a nice $1.7 million purse all pointed to success and, judging by the size of galleries at this Kia Classic, it paid off. 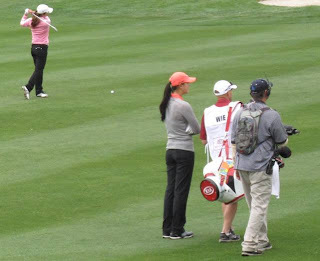 The only drawback was the cold rainy weather leaving few golfers in skirts and many in rain gear, like Hawaii's Michelle Wie (pictured wearing the orange cap) who is sponsored by Kia and tied for 7th at 8 under par today. Friday's second round was suspended for 3 hours leaving many to finish their rounds and play their 3rd round on Saturday. If the weather cooperates next year, the Kia Classic could draw even bigger crowds. Kia's sports sponsorships run deep with its FIFA soccer partnership, Australian Open tennis, NBA basketball and LPGA golf. Kia had a record year in 2010 with sales of 356,268. 2011 sales for January and February of 60,595 is a 31.2 percent gain over the first two months of last year so it looks like the marketing is working. After battling atop the leaderboard all day, it came down to two short putts on the 18th hole by Korea's Jivai Shin and Germany's Sandra Gal. Shin's birdie putt lipped out while Gal sunk the shorter of the two putts for a 16 under par total after 4 rounds good for her first LPGA Tour victory and a check for $255,000. Gal, the first first-time winner on the LPGA Tour this season was ranked 100th coming into event before outlasting number 2 ranked Shin. The Kia Classic comes on the weekend before the ladies' tour first major tournament of the season, the Kraft Nabisco Championship in Rancho Mirage so many top golfers compete as a warm-up to the major which offers $2 million in prize money.. Overall vehicle dependability has improved from 2010, with automakers succeeding in reducing problem rates in many traditional areas, but experiencing some challenges in overcoming problems with newer technologies and features, according to the J.D. Power and Associates 2011 U.S. Vehicle Dependability Study released Thursday. In 2011, overall vehicle dependability averages 151 PP100—the lowest problem rate since the inception of the study in 1990—and improves from 170 PP 100 in 2009. Between 2009 and 2011, annual improvement for the industry has averaged 6 percent, which is slightly lower than historical rates of improvement. During the past decade, industry improvement has averaged 8 percent each year. Lincoln MKZ and Lincoln Navigator. General Motors (Buick Lucerne, Cadillac DTS, and Chevrolet Tahoe) and Honda Motor Company (Acura RL, Honda CR-V and Honda Fit) each receive three awards. In addition, the following models also receive awards: BMW X3, Mazda MX-5 Miata, and Mercedes-Benz CLK. the 2011 VDS after 90 days of ownership. While domestic brand cars have fewer problems (135 PP100, on average) than import brand cars (147 PP100, on average), trucks and crossover vehicles (1) of import brands have considerably fewer problems than those of domestic brands. In addition to affecting brand image and brand loyalty, long-term dependability also has a notable effect on dealership service and customer service spending. As the number of problems experienced increases, owners are increasingly likely to use non-dealer service facilities for paid service work. In addition, as the number of problems increases, the percentage of owners who say they "definitely will" return to their dealer for service diminishes. Among owners who indicate they have experienced no problems, 76 percent indicate they "definitely will" return to the dealer for paid service. This proportion decreases to 42 percent among owners who say they experienced six or more problems. (1) The truck category includes both pickup trucks and vans, while the crossover vehicle category includes crossover vehicles, multi-purpose vehicles and utility vehicles. *No other model in this segment performs above the segment average. NOTE: For a segment award to be issued, there must be at least three models with sufficient sample that comprise 80 percent of market sales within an award segment. There are only two premium sporty models with sufficient sample size, thus no premium sporty awards have been presented. Quality is a top priority at all automakers and every executive has a different way of expressing the quality culture at their respective companies. Carlos Tavares, Executive Vice President of Nissan Motor Corp. and board member stresses the importance of the customer in the quality equation. Many OEMs are embracing comprehensive online technology to get detailed feedback from their customers so engineers can understand and immediately respond to issues as they emerge. General Motors total sales in the United States rose 49 percent in February, as dealers reported 207,028 deliveries for the company’s four brands. During the month, retail sales rose 70 percent – the highest year-over-year gain in the company’s history. GM has sold 385,924 in 2011, a 35.9 percent rise over the first two months of 2010. Ford’s total February sales, including sales to fleet customers, were 156,626, up 14 percent. In the first two months of 2011, Ford sales totaled 283,943, up 14 percent versus the same period a year ago. Toyota Motor Sales, U.S.A., reported February sales of 141,846, up 41.8 percent over the year-ago month. The Toyota Division posted February total sales of 128,032, an increase of 48.5 percent over the same period last year. The Lexus Division reported total sales of 13,814, flat from last February.Year-to-date, Toyota has sold 257,702 vehicles, up 29.6 percent over 2010. American Honda posted February sales of 98,059, an increase of 21.6 percent compared to February 2010. Year-to-date sales of 174,328 is an increase of 17.7 percent. Honda Division posted February sales of 87,263, an increase of 21.7 percent compared to February 2010 and Acura division sales increased 20.8 percent to 10,796. Chrysler Group reported U.S. sales of 95,102, a 13 percent increase compared with sales in February 2010. Year-to-date Chrysler has sold 165,220 vehicles, a 17 percent increase over 2010. Nissan North America reported record February U.S. sales of 92,370, an increase of 31.6 percent. Nissan Division sales were up 31.8 percent for the month and also set a new February record. Sales of Infiniti vehicles rose 29.9 percent over the prior year. Year-to-date sales are 164,217, up 23.7 percent from 2010. Hyundai Motor America announced record February sales of 43,533, up 28 percent compared with the same period last year. For the year, total Hyundai sales are 80,747, up 25 percent. Kia Motors America had its best ever February sales of 32,806, up 36.4 percent from 2010. Year-to-date sales are 60,595, up 31.2 percent from last year. Volkswagen of America reported 21,461 units sold in February 2011, an 18.5 percent increase over prior year sales. VW has sold 39,862 vehicles in the first two months of the year, a 10.3 percent increase over 2010. Separately, Audi reported record-setting February U.S. sales of 7,753. For the first two months in 2011, Audi has sold 15,565, a 22.3 percent rise over the same period last year. Subaru of America continued record-breaking sales for February at 21,683 sold, up 19,8 percent compared to the previous year. Year-to-date, Subaru sales are 40,541 vehicles. The BMW Group in the U.S. (BMW and MINI combined) reported February sales of 19,919 vehicles, an increase of 10.8 percent from same month a year ago. Sales of BMW brand vehicles increased 8.7 percent in February for a total of 16,416 compared to February 2010. Year-to-date BMW has sold 38,575, an increase of 15.6 percent over 2010. Mazda North American Operations reported February 2011 sales of 19,387, an increase of 13.7 percent versus February of 2010. Year-to-date Mazda sales are 32,748, up 2.8 percent from last year. Mercedes-Benz USA reported February sales of 16,176 vehicles, a 5.1 percent gain over February 2010. On a year-to-date basis, the 33,449 vehicles sold represent a 9.5 percent increase. Mitsubishi Motors North America reported February 2011 sales of 6,893 vehicles, a 71.5 percent rise from the same month in 2010. Year-to-date Mitsubishi sales are 12,607, a 54 percent jump from 2010. Jaguar Land Rover sales of 3,247 in February is an increase of 16 percent over 2010 with Jaguar sales at 692, a drop of 9 percent vs. last year and Land Rover at 2,555, a 26 percent increase. Year-to-date, JLR sales are 6,453, a 20 percent rise over 2010. Jag sales are 1,627, a 17 percent gain and Land Rover sales are 4,826, a 21 percent increase. Porsche Cars North America announced February sales in the U.S. of 2,019 units, an increase of 32 percent. Year-to-date Porsche sales are 4,419 up from 3,317 last year. American Suzuki sold 1,643 vehicles in February, an increase of 19 percent over last year. Year-to-date Suzuki has sold 4,205, up 23 percent from 2010.